Oak has fully equipped computer laboratory. It has advanced infrastructure in terms of hardware and software which cater to the requirements of the students, teachers and the curriculum. The department has qualified committed teachers to teach different classes at different levels. The faculty members make continuous efforts to see that the students must get expertise in practical implementation of the tools they have in their curriculum. The information technology curriculum has been planned in such a way that the students of primary classes to secondary classes will get exposure to various technologies and software. 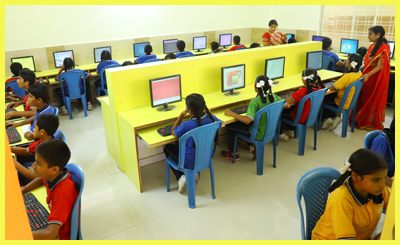 In the primary section, the students are trained to use basic software like windows, Ms- Office and Ms- word etc. Along with this, they get exposure to computer programming at elementary stage through the computer languages like LOGO and Q Basic in order to improve their logical skills. The students are assessed on their practical skills over a regular time interval via projects and assignments given to them. In the higher classes the students have an option to learn advanced software which is the part of their curriculum. The students get exposure to the latest multimedia softwares like FLASH, PHOTOSHOP etc. Math Lab is a place where students can learn and explore mathematical concepts and verify mathematical facts through a variety of activities using different materials. These activities are carried out by the teachers or the students to explore learning to stimulate interest and develop favourable attitude towards Mathematics. It provides an opportunity to students to understand and internalize the basic mathematical concepts through concrete objects and situations. The laboratory allows and encourages the students to think, discuss with each other and the teacher assimilates the concepts in a more effective manner. It enables the teacher to demonstrate, explain and reinforce abstract mathematical ideas by using concrete objects, models, charts, graphs, pictures etc. Students are taken to the lab once a week to learn or review the concepts taught in class. The chemistry laboratory is designed while keeping all the statutory norms and safety standards. It is well ventilated as well as spacious. It has some of the most accurate digital measuring instruments required for measuring chemicals. Here, a scientific attitude is developed in the students along with the ability to analyze, collate, compute, integrate and deduce. In the lab, the students learn to handle apparatus and chemicals. They improve their understanding of various chemical reactions and chemical processes. It enables personal verification of important experimental facts. Logic and reasoning skills that develop in this lab will go a long way in ensuring success in later life. Well planned, spacious and well equipped physics lab has all the interesting sets of equipment to reinforce scientific and experimental concepts and facilities in developing investigative skills. 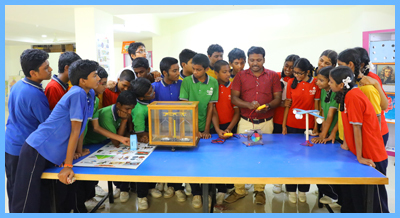 There are models, charts, apparatus, kits and experimental gadgets to cater the needs of students. In the Physics lab, students discover the law which governs a certain phenomenon or verify a given law which has been derived from a theory. Continuing the Spirit of Science Exploration for Tomorrow's Science Innovation – Many world famous scientists with their infinite sense of wonder and dedication have contributed many valuable inventions and discoveries that we are enjoying today in our daily lives. Today's students should be trained and encouraged to carry on in the spirit of our famous scientists, for which we have provided a fully equipped Biology lab that brings the natural sciences, innovative technology, complete curriculum activities, and time-saving resources into science classrooms, so teachers can inspire their students to embark on their own journey of science discovery. 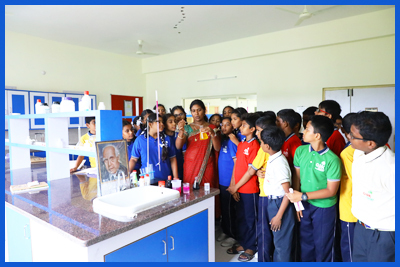 Environment plays a great role in imparting education - The atmosphere of the Social Science Lab will motivate the child and inspire him/her to study the subject more attentively. So we have provided a spacious social science lab for our students with all the required material like - models, samples, sketches, maps, globes and several pictures related to History, Geography, Civics and 3D models showing day and night formation & Solar System. The language laboratory is an audio or audio-visual installation used as an aid in modern language teaching. It allows a teacher to listen to and manage student audio via a hard wired analogue tape deck based system with “ sound booths” in fixed locations. English language lab is there in OAK to maintain a good linguistic competence through accuracy in grammar, punctuation, vocabulary and more effective learning. It is a network based teaching.